The BankAmericard Premium Rewards currently has an Informr score of 8.8 out of 10. This score is based on our evaluation of 16 sources including reviews from users and the web's most trusted critics. BankAmericard Premium Rewards is typically available to those with good credit scores (650 or greater). A strong contender because you can earn more points per dollar, plus there’s the option to receive a sign-up bonus, bonus reward points, and extra travel statement credits. 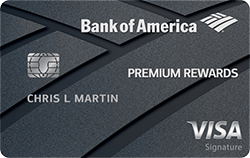 The new Bank of America Premium Rewards card combines the features of a cash back card with the features of a premium travel card for a great value. Of all the cards we analyzed, this one offers the absolute best cash-back rate out there. However, you’ll need a three-month average combined balance in your qualifying Bank of America and/or Merrill Lynch and Merrill Edge accounts of $100,000 in order to get this rate. This is a really interesting card. There are many pros and cons so I think it all comes down to how you want to use the card. I wouldn’t suggest using it as a strategic card (i.e. only using it for specific purchases) because the rewards structure is pretty flat (and unflattering). Where the card shines, though, is through the additional perks you get (like return protection and no transaction fees). If you love food and travel, the Bank of America Premium Rewards Credit Card offers good value and benefits. Between its rewards and introductory bonus, along with benefits like the $100 airline credit and $100 Global Entry/TSA Pre✓ credit, there are plenty of ways to save money and offset the $95 annual fee. One of the best rewards cards for people with excellent credit who like to travel and dine out. This is more than just a rewards card as it includes many travel benefits usually associated with cards that carry higher annual fees. You can enjoy travel cover for a range of inconveniences, plus up to $200 in statement credit in your first year when you pay for certain travel incidentals. An excellent rewards credit card for people who enjoy traveling because it offers a solid range of travel benefits, such as up to $200 in travel statement credit rewards, world class travel perks, no foreign transaction fees, travel insurance protection and more despite having a very reasonable $95 annual fee. The Bank of America Premium Rewards Credit Card is an excellent travel credit card, especially for individuals who have $20,000 or more deposited with Bank of America. If you don't have any relationship with the bank, we recommend looking at alternatives, like the Chase Sapphire Preferred® Card.